Come enjoy vintage bikes, great company, good food, and the beauties of the Pasadena area with us! The ride starts at the Rose Bowl in Pasadena, California the first Sunday of every month. We meet at the pool/picnic area (Aquatic Center) parking lot at the southern-most end of Brookside Park at 10:30 am to introduce ourselves, talk vintage bikes and swap parts. The ride starts at 11:00 am. The ride is a casual-paced 25 miles long through Pasadena, South Pasadena, San Marino, Temple City, Arcadia, Sierra Madre (stop at Bean Town for ice cream, coffee or lunch), Altadena, and back to the Rose Bowl for more vintage bike talk. The ride is mostly flat with one moderate climb (fixed gears are fine in other words). The ride has been going on for the past fifteen years, rain or shine, whether anyone shows up or not (usually there are between three and twenty five riders). Everyone is encouraged to bring and ride a 1985 or earlier bicycle, but feel free to ride anything you have. 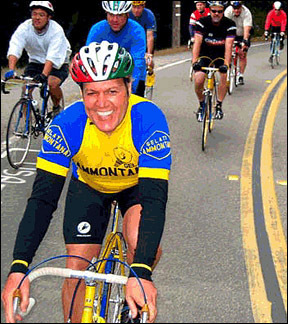 If you ride with Chuck Schmidt and friends, it's best to bring a bicycle built before Greg LeMond won the Tour de France. "Anything before click shifting or click-in pedals," Schmidt says, explaining the accepted ground rules for the small group of retro-bike fanatics who meet every first Sunday of the month at the Rose Bowl. It's not that the last good bicycle was made in the mid-'80s. And Schmidt, a graphic designer and teacher, quickly dispels the notion that he's a Luddite. But to his artistically tuned eye, and to the hearts, legs and bottoms of an increasing number of cycling fans, something got lost in the sprint toward the 14-pound bicycle that began roughly when LeMond lifted his arms on the Champs-Elysées. With even the storied Italian frame makers - Faliero Masi, Ugo De Rosa, Ernesto Colnago - giving in to aluminum, carbon and titanium frames, the craft of welding steel-alloy tubes into ornately cut lugs to form the ruggedly elegant geometry of a bicycle frame survives mostly in a niche of custom frame builders. But there is more than grumpy nostalgia for bygone days driving serious racers back to their first love. "The thing that has people coming back to lugged-steel frames is that they ride nice, they look neat," says Schmidt. And for all but the most serious riders, Schmidt insists, a few extra pounds of bicycle frame don't make much difference. A robust 60-year-old with a tanned Jack La Lanne build and youthful grin, Schmidt often chooses to do the Sunday ride on his fixed-gear 1959 Mercian, a delightfully spare bike with no derailleur or rear brake. He restored the pesto cream colored frame and outfitted it with rare GB parts made by Gerald Burgess, a postwar British manufacturer whose family now makes furniture. By coincidence, Greg Townsend, 45, pulls up with a red Mercian that he dates to 1962 or 1963. A skeptical Schmidt silently looks it over, then suggests it's from the 1970s - a suspicion confirmed when Townsend flips it over and finds a 73 in the serial number. Townsend, who still races on a thoroughly modern bike, says he fell in with the retro crowd by accident of time. "It turns out that I just got old and still have lots of parts," he explains. Another rider interrupts: "Gosh, those hubs are great, are they Campagnolo?" "No, they're Airlites," Townsend says. A British transplant who grew up in the Midwest, he recalls going to races where riders who had been extras in the 1979 movie "Breaking Away" were introduced at the starting line as if they were stars. Looking back at the film, there are details that now seem as quaint as driving goggles: toe clips, baggy cotton shorts, loose wool jerseys. All are de rigueur for the Sunday ride. Steve Maas, who looks like what he is - a 54-year-old electrical engineer from Long Beach - promenades his Hetchins Magnum Opus, 1981, with its baroquely embellished lug work, filigreed along the tubes at every joint (don't overlook the twin-plate fork crown, either ). "It's fairly new by the standards of this group," says Maas, who bought the ride in December from a guy in Scotland for $1,200, complete with a full gruppo of Campagnolo parts. "Oh, you stole that thing!" exclaims Fred Crane, a La Cañada Flintridge accountant who shows up astride a Space Age carbon-fiber Kestrel but quickly explains that he meant to bring his vintage Gitane, which had an unexpected flat. The belle of the ball on a recent Sunday ride, might just be actor Scott Smith's 1974 sky-blue Masi Gran Criterium, built in Carlsbad (yes, California) during the brief time when frame craftsman Faliero Masi licensed out his production there. These are highly prized bicycles that can sell for many multiples of their original price. From that shop sprang arguably the best craftsmen in the trade in California, including the late Mario Confente and Brian Baylis, who still builds custom bicycles. "This is No. 670," Smith boasts, showing the serial number on the bottom bracket. "I think I have 363 and 4-O-something," adds Matthew Gorski, proud owner of seven classic Masi bikes. Smith, 42, is a new collector, with the Masi and a 1982 Colnago Super. "I keep my collection focused," he explains. "It keeps the wife from getting crazy." Two bikes are nothing. Even Maas is bashful about his own stable. "I don't call myself a collector," Maas says. "I have about a dozen old bikes." Faces turn to Schmidt, and there are jokes about the proverbial "cat lady" who dies and leaves behind dozens of animals. Schmidt is coy about his collection: "I don't know. No one knows. Somewhere around 50." If you want to see them, you have to ride with him. They push off at 11 a.m., at a conversational pace (mostly about EBay vintage bike auctions) that takes them through South Pasadena, San Marino, Temple City and eventually to Sierra Madre. There are only two strict rules to the ride. First, there is no ride leader. And second, Schmidt explains, "The ride goes on, even if nobody shows up." When the ride winds down in Sierra Madre, riders bypass the busy Starbucks that dominates the downtown square. They settle up the street, at Bean Town, a local coffee shop, instead. The place has been around for decades, a length of time Chuck acknowledges with a slight grin.